Amelia Bande is a writer. She works in performance, theater, film. Her writing talks about life and friendships in a high-tech mode, the possibilities and failures of a perpetual scroll down. Her plays ‘Chueca’ and ‘Partir y Renunciar’ were staged and published in Santiago, Chile. Working in the project space Kotti-Shop in Berlin, she organized the monthly event ´Get Done´ and the writing workshop series ‘Dancing with Words’ and ‘Write the Body Electric’. 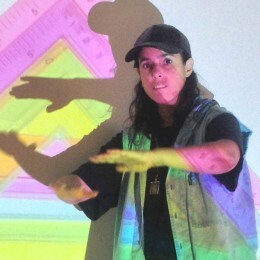 She is part of the Gels Collective, writing the scripts for the group´s experimental animations and film installations. She is co-founder of Publishing Puppies, an independent press for visual work, poetry and fiction. Her work, solo and collaborative, has recently been shown at MIX NYC, 41 Cooper Gallery, The Shandaken Project at Storm King Arts Center, NewBridge Project in Newcastle, Pratt Manhattan Gallery, KJCC at NYU, NGBK Berlin and Flutgraben Kunstfabrik Berlin. She lives in New York.